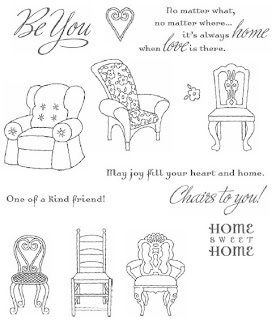 Chairs To You Blog Hop! Welcome to our Stamp of the Month Blog Hop! 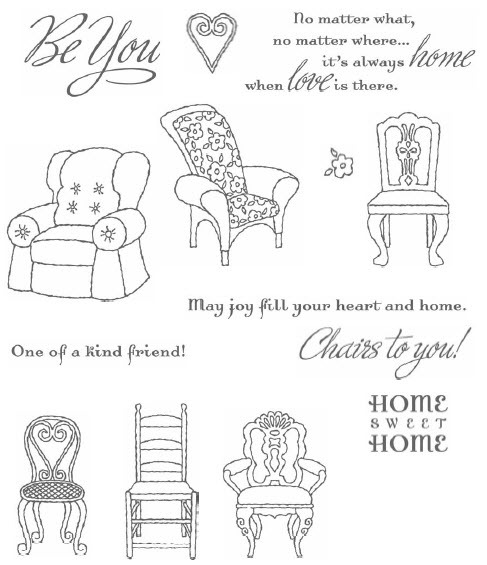 We will be featuring the May Stamp of the Month (SOTM), "Chairs to You", a set of 14 stamps. If you have come here from Adeline's Blog you are on the right path! The blog hop is a great big circle, so you can start here and work your way all around. If you get lost along the way, you’ll find the complete list of participating consultants here. This saying really hit me since my husband and I live far away from family. It's such a precious and true saying. I love that the images from this stamp set are outline images, allowing you to use the B&T as texture for the furniture coverings. I have seen some cute creations using this stamp set and am anxious to make some other items with it. Now "Hop" on over to Wendy's Blog to see her work! Be sure to visit all the Consultants at their Blogs to get some great crafting ideas and other fun ideas! Remember, the SOTM is only available until the end of April, 2011! 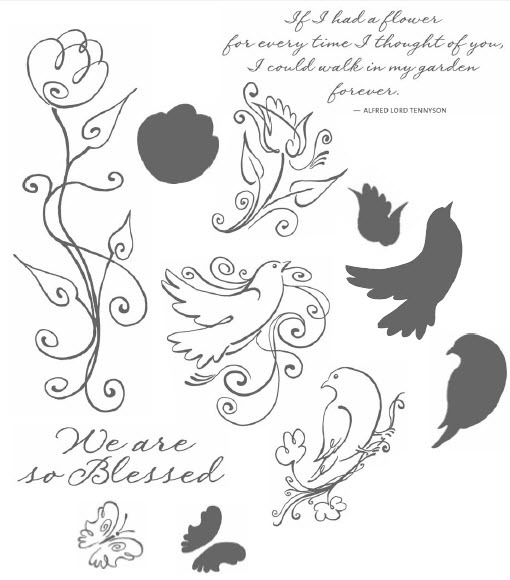 Click here to see how you can get this stamp set at a discount or even free! I have additional samples viewable on my website! Click here to view them! Supply list: D1456 Chairs To You, Lucky paper packet, Bitty Sparkles. Today I was joined by several of my team members - locally and in Salisbury, NC and Rusk, TX - for our quarterly team event. We had a great time sharing some laughs, eating great food, and learning various techniques and projects to incorporate into our businesses. Teri Baxter and I, my dear friend, have worked together to co-host these events across the country and I am thankful for her! Attendees created these two layouts made out of Fanfare. We used a portion of a Level 2 paper packet, Level 2 Stickease, Blue Buttons and White Daisy Ribbon to make these fun layouts - perfect for "summer time" photos! Check back next week to see the other project we worked on - a cute notebox and matching cards! (The Stamp of the Month blog hop goes live tomorrow!) Have a blessed weekend! I fell in love with this basket after seeing it on Lisa Stenz' blog and decided to teach it as my club project for April. I designed my version using the Mayberry paper packet and the April SOTM, "Be Blessed", to provide a little versatility since we met too close to Easter. Our focus product for this month were the Kraft Borders and I love how it provided a cute accent on the front of the basket. A couple of my friends helped me brainstorm some things I could use to fill in the basket - there are tons of options. My club members got to fill theirs with jelly beans, Peeps lip gloss, and some yummy chocolate (Hershey Kisses and Reese's Peanut Butter Cups). There were a huge hit! Thanks for your inspiration and for sharing, Lisa! I hope you enjoyed a blessed and enjoyable Easter. This year my husband and I spent Easter in Florida but it was not a pre-planned trip. Unfortunately, his eldest brother passed away on April 14th and we made the trip for his funeral. While it was not a good reason we all came together, it was nice seeing family and sharing in some fun laughs and memories in Sidney's honor. I hadn't been back to Florida in a couple of years and it sure was beautiful! I loved seeing all the water and of course right now..the weather was awesome! Gotta love that breeze! Here are a few fun photos from our visit. Hubby and I before leaving for funeral. I thought this stamp set was cute, just from the flyer and artwork I had seen, but it is even more beautiful in person! This weekend I attended my friend's retreat and had the chance to make this 5x7 card, from the Wishes program, incorporating it. I used the Mayberry paper packet and Kraft borders. I would have never thought that borders would be so much fun to play with but I love these! They do come in a kraft (light brown) color and can be sponged in colors to coordinate with your artwork. Here I colored them in Cocoa to match the paper packet. It might be difficult to tell but I did 3-D the heart in the middle of the image, adding some fun dimension to the card. If you have not already bought this adorable stamp set for just $5 with 100% of the proceeds to benefit the American Red Cross Japan Relief Efforts, you still have until the end of the month to do so. It's a cute stamp set for a great cause! Contact me for additional details or visit by website by clicking here. Welcome to our Technique Blog Hop! This month there are 12 of us highlighting the “Layered Flowers” Technique as shown on page 7 in the Spring/Summer 2011 Idea Book! This blog hop is a great big circle so you can start wherever you want and continue through to see all the fabulous artwork incorporating this technique. If you would like to start from the beginning, please visit this link. While there you will also find a listing of all participants and their blog addresses if you should get lost or want to reference a blog along the way. Let’s get started! If you are coming from Heather's Blog, you are on the right track! This technique is highlighted with the Sophia paper packet in the Idea Book but you will find variations for its’ use through this hop. This month I chose to use our beautiful Clear Cards. I absolutely love the different visual appeal you can create with these cards. They are so much fun to play with so if you haven't given them a try...maybe it's about time to do so! I followed the technique directions as provided in the Idea Book but used the "Dreams Come True" stamp set and the darling Mayberry paper packet for my creation. (This paper pack will be come one of your favorites once you see it in person.) To create the leaves, I just cut them out of cardstock by hand and crumpled them. With the white core of our unique cardstock, it provided this nice "weathering" effect. Here's a close-up if the flower and a better photo to view the layering. Of course, you always have to add some bling to put the perfect touch. I used our Pearl Opaques. If you would like to see details on the technique or my supply list, please continue reading below. If not, please continue onto Becca's Blog where you will find some additional artwork highlighting this technique! Be sure to leave a comment and let me know what you thought of my variation and happy hopping! Supply List: D1470 Dreams Come True, X7136B Mayberry Level 2 paper packet, Z1323 Clear Cards, Z1336 Pearl Opaque Adhesive Gems, Smoothie Ink, Cocoa Ink, Olive Ink, Colonial White Grosgrain Ribbon. Stamp base image in one color and outline in another (if applicable to stamp selected). Repeat on another piece of cardstock. Trim first image around all outer images. Trim second image, cutting out portions of the flower (to create the layered effect). Curl ends of petals on second image and adhere on top of first image. Layer mixtures of stamped accent and embellishments to finish. Thanks for stopping by! Continue onto Becca's Blog to continue the hop! This little guy was such a ham with all us woman at my team retreat which was held in February. He decided to go on the hay ride with us and did not shy away from the camera - at all! He took it all in and enjoyed the attention. I created this wall-hanging out of the front (or back) cover of our 9x9 My Creations Showcase Album and thought the Fanfare paper packet was perfect to highlight this photo. I used some of our Bitty Sparkles to provide some accents around the Stars Dimensional Elements (sponged in Cranberry and Sky ink). The title was created by sponging our Oxford Color-Ready Alphabet in Pacifica Ink.